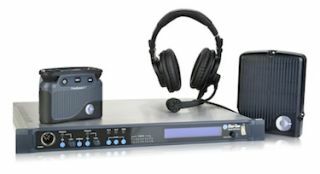 The What: Clear-Com’s FreeSpeak II 1.9GHz has already proven to be an exceptional wireless intercom system for large scale productions. The system includes a newly designed wireless beltpack and active antenna, which delivers a more expansive cellular wireless coverage as well as more reliable connection than its predecessor, known as CellCom in North America and FreeSpeak in the rest of the world. FreeSpeak II operates in multiple world-wide license-free bands from 1.897-1.933 GHz. The What Else: In addition to the 1.9GHz, FreeSpeak II can also now operate in the 2.4GHz frequency band with new system components. Even though FreeSpeak II 2.4GHz will have a separate yet similar set of system components as the 1.9GHz version--namely a base station, wireless beltpack, active antenna, splitter, and battery charger--the same base station or integrated FreeSpeak II systems can co-operate a mix of 1.9GHz and 2.4GHz beltpacks and antennas thus increasing both the quantity of wireless users and cell roaming area.